Published January 21, 2018 By Anna T. This post may contain affiliate links. Regardless, I only recommend sites I've researched and/or used and trust. Study.com is a company that provides online college-level educational opportunities. Students can take courses on a wide variety of subjects through the site, and gain actual credit hours that can be transferred to thousands of colleges and university programs. Most of their lessons are video based, but they also offer text based lessons and resources for their students. Much of the written content is produced by work-at-home copywriters, and they also hire work-at-home video editors. The company actually provides very little information on the nature of the work through their website, so I had to piece together what I could by reading personal accounts from people who worked there in the past. Some of the information I found was contradictory, possibly because many of the reports came from people who worked there at different times, and there may have been some policy changes over the years. From what I could determine, if you're working for Study.com as a content writer, you are expected to select articles from a pool that other writers also have access to, and you are paid by the article. You can work as little or as much as you want, and are able to send questions to staff about tricky issues that come up during the writing process. The jobs themselves vary quite a bit. On any given day, you might be writing lessons, questions for tests, or informational essays that have some relation to one of their courses. A lot of writers who worked there described an environment where the work was constantly changing. There might be a long period during which the company needs certain kinds of content, and then they’ll abruptly switch to something else, so you’ll probably need to be adaptable and quick to pick up new systems to have success working as a Study.com content writer. As for their other positions, such as work-at-home video editing, information was a little harder to come by, possibly because the company doesn't hire as many people for those jobs. But from what I could gather, it all sounds pretty similar to their writing work in a lot of ways. You pick which projects you want to work on, and can complete them on whatever schedule is comfortable for you. Video editors are expected to work on audio files, create graphics for the videos they're editing, and provide informative text captions. The company pays out twice monthly through Paypal, and you are only paid when your work is accepted by the staff. There’s a good deal of variation in the pay rate depending on which position you’re hired for. 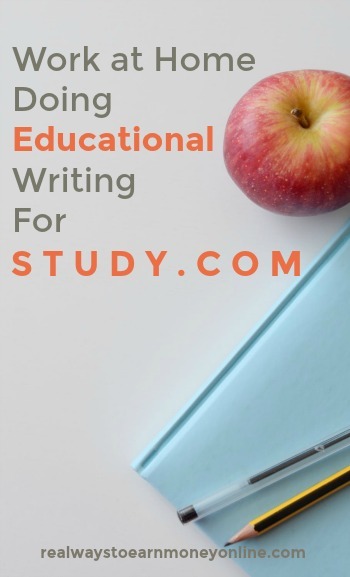 Since their writing work is paid on a per-article basis, the hourly rate will depend on the difficulty of the work, the price offered per lesson or article, and the speed of the individual writer. From what I was able to find online, writers get paid different rates depending on what work the company is offering at a given time. One person mentioned getting 40 dollars for writing a single lesson. Another person mentioned four dollars for providing short answers to questions in some sort of document. Since the work seems to change periodically, the rate will likely change as well. With all that taken into account, the general estimated hourly rate seems to be anywhere from 10 dollars per hour, to about 20 dollars per hour, with a few people reporting much higher wages, and a few reporting much lower. On their website the company is more explicit about the exact pay rate for video editors, and apparently they earn 14 dollars for every 2-minutes of finished video, which sounds pretty good on the surface, but it can potentially take a long time to edit two minutes of video to a very high quality level, particularly if you’re having to design custom graphics. Based on all my research, scheduling is totally flexible. You can work whenever you feel like it, and as often as you like. One person mentioned that it was easier to find work, and get help from the staff if you adjust your schedule to match daytime west-coast work hours, but this isn't mandatory at all. All the writing positions generally seem to require a college education in whatever subject you're specializing in, and some of them also expect you to have actual real life experience working in a particular field. The video editing jobs are less explicit about expecting a specific educational background, but you’ll need to be technically proficient with popular editing software programs like Final Cut Pro, Adobe Premier, and Adobe After Effects. It probably also wouldn’t hurt to have certification or some sort of professional background in multimedia production. There are no technical requirements for those wanting a content writing job with the company, but top-of-the-line video editing software can be very taxing on a computer, so you'll probably need a reasonably powerful machine for those jobs. To apply for this job, you'll need to fill out an online questionnaire, provide a resume, and give appropriate samples of your work for evaluation purposes. For video editing jobs, you'll have to edit a 1-minute sample video using a piece of narration they provide. I used Glassdoor.com, and indeed.com to find real life personal accounts from people who've worked for this company. At first glance a lot of the feedback looked very, very positive, particularly on Glassdoor, but then I noticed that most of the people giving glowing reviews were employees who worked on-site at the company headquarters. The reviews from home-based workers were somewhat less positive, although still pretty decent. Most people were pleased with the scheduling flexibility offered in all the different jobs, and some found the work itself to be fairly easy. Many complained about the pay rate, particularly in comparison to the level of education they expect you to have for certain jobs. There was a sense that high levels of expertise weren't being properly compensated. Many people enjoyed working for the company but wished their was more stability. The availability of work seems to change quite often, particularly with writing jobs. Some people said they were hired during a time when the company needed a great deal of copywriting work, focused on a particular subject, and then when all that work was completed, everything dried up suddenly and no more work was ever offered. Overall, it sounds like this is a pretty decent place to work if you're okay with the pay rate, but you may not be able to rely on the company for long-term employment. Many copywriters like to contract out to several different employers at once to keep a safe and steady flow of work, and for someone like that, this company might be a nice thing to add to your list. If you like the sound of everything, and you have the required skills, go HERE to have a look at the available positions, and apply for a job. This is the most profitable route to take as a freelance writer. You can get your own clients and set your own rates, which you cannot really do with content sites. A six-figure income is not outside the realm of possibility when you're running your own business. I am a contractor at Study.com and I do recommend the company. As you mention here the pay rate depends on what you do and how fast you do it. They have several projects available and some of them are worth your time while other are not. The workload varies widely over time and so will your income. As a freelancer I have several sources of income, so I am not worried about them not having a constant workload. Overall, the company is legitimate, they pay on time, the rates are fair (but not great), the work is flexible and interesting.